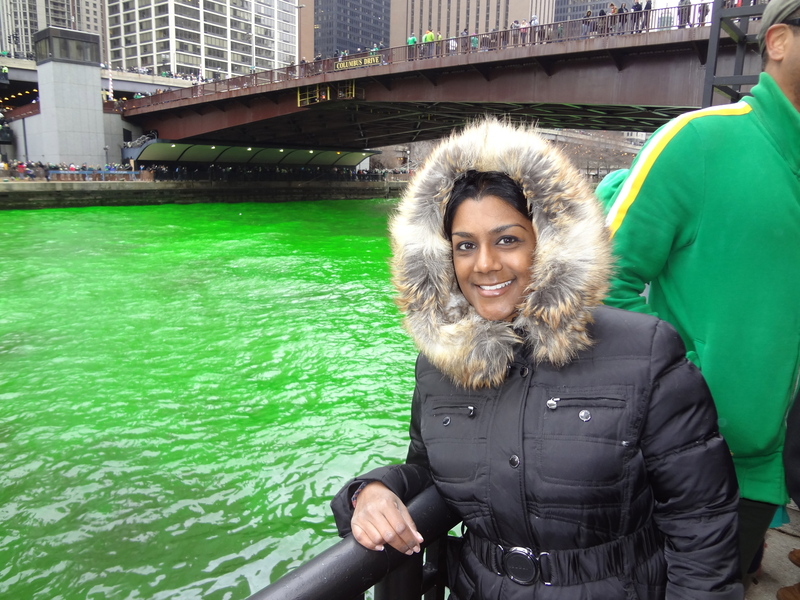 As my friend Kristy said, I moved to Chicago just in time for the big St. Patrick’s Day festivities. And boy does this city go all out! 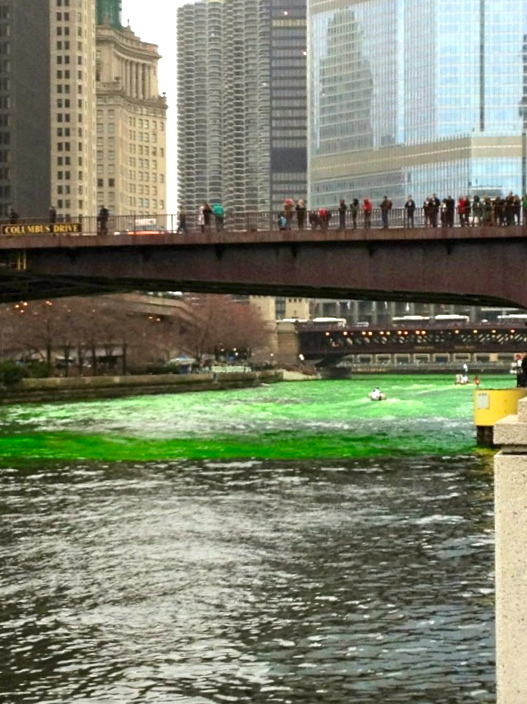 The holiday is kicked off by dying the Chicago River green. This was something I really wanted to see! Not knowing what to expect, I ended up walking towards the water, and followed the people headed that way. To be honest, I was amazed at how uncrowded it was! There were so many viewing points, that there was plenty of room for everyone. I arrived about 10 minutes before the main event, and got a prime viewing spot. At first, there’s not much to see. 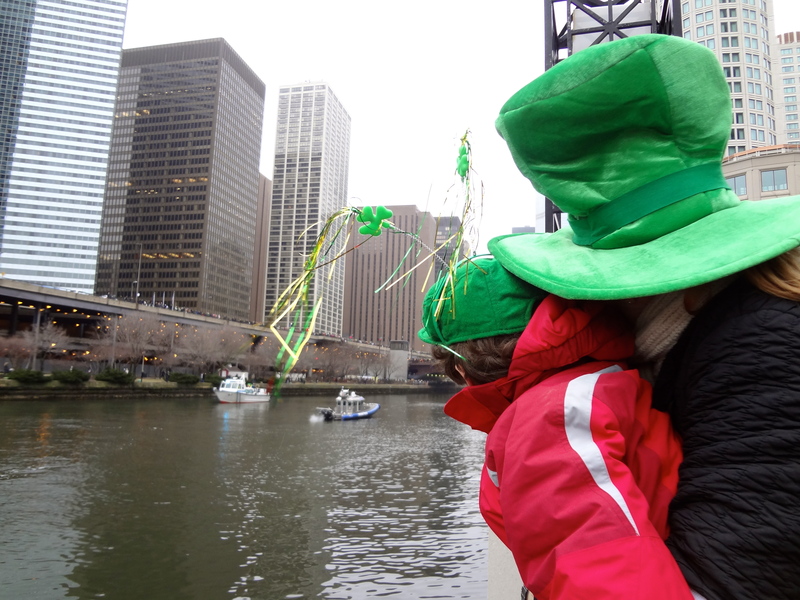 As this little reveler pointed out to his mother, the water already seemed a bit green at this point! 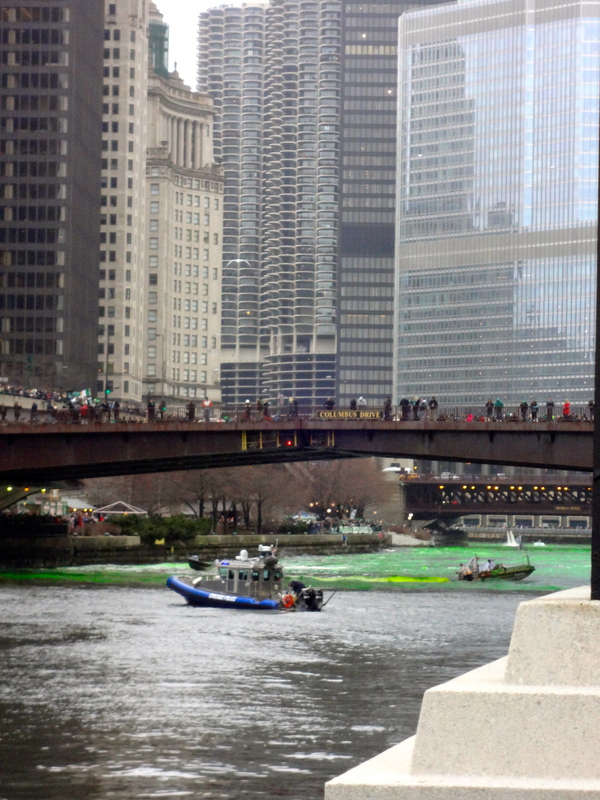 Here, you can see the boats stirring up the color and helping it spread further down the river. If you didn’t by my magic leprechauns theory, there’s another explanation. The dye was originally formulated as a substance to identify buildings illegally dumping waste into the river. The bright emerald green color, and its staying power, was so unique that it became part of the St.Patrick’s Day tradition. 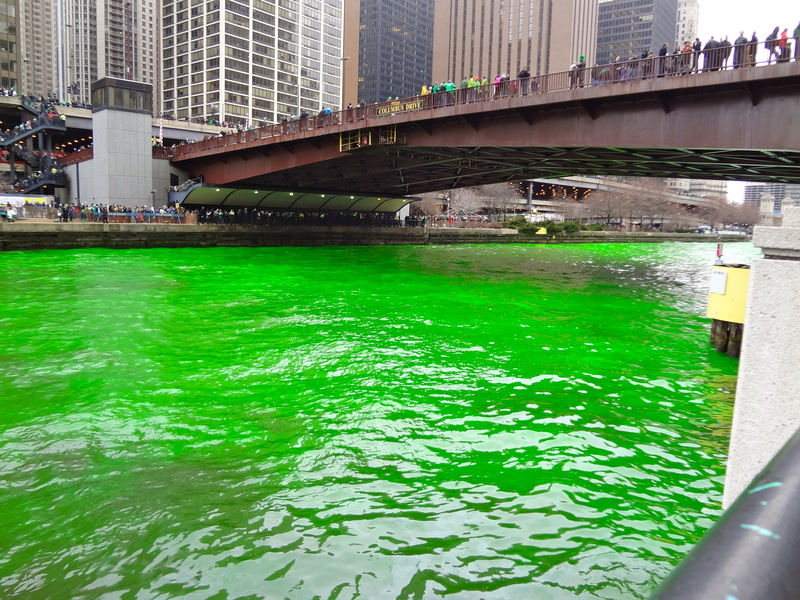 Other cities have attempted to replicate this wonder, but they dye is a closely guarded Chicago secret. 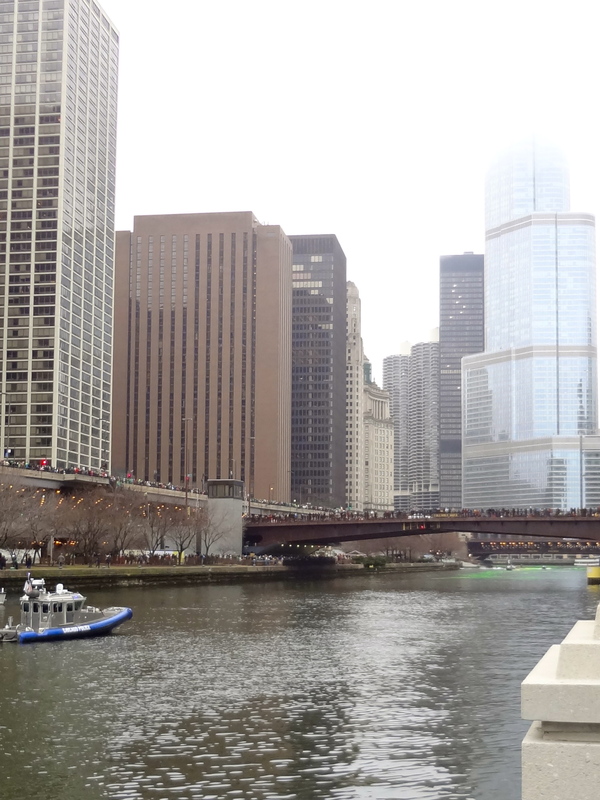 Now in it’s 51st year, and with an estimated 400,000 spectators this year, the dying of the Chicago River seems like a tradition that will stick around for many years to come! I could not believe how brilliantly green the water became! A very cool sight to see. While I didn’t catch the parade this year, I heard it was a good time. Later that evening I met up with some new friends and raised a pint (ok, several pints). 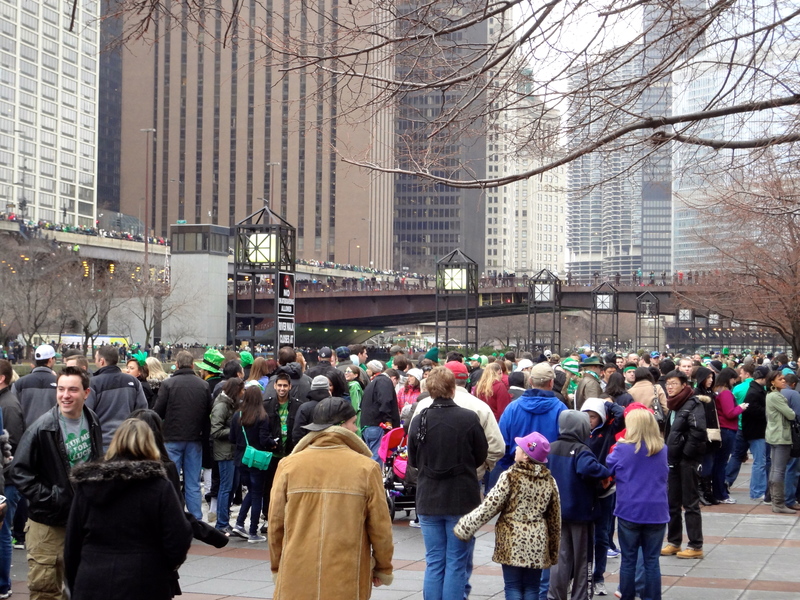 It was a great way to spend my first St.Patrick’s Day in Chicago! Great pics of the succession of green! Glad you are enjoying. Thanks Cathy! Thought of you… seemed like something you would enjoy! 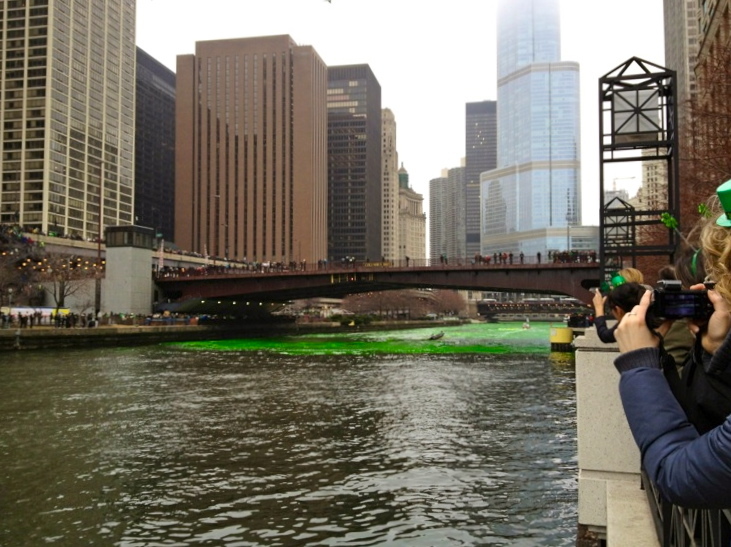 I never actually watched them turn the river green, I just saw it when it was already done. So cool! And you look very toasty in your (faux) fur jacket!! lol, I didn’t realize that’s what I looked like until well after the fact! But I was so cold at the time I didn’t notice!